Elasmobranchs are known from almost all the world’s oceans (the Antarctic ocean is shark-free, although climate change may change that in future), with some even found in freshwater lakes and rivers. In their 1995 paper in the Journal of Aquariculture and Aquatic Sciences, Leonard Compagno and the late Sid Cook listed 68 elasmobranch species that were either obligate freshwater dwellers (i.e. were found only in freshwater), penetrated far into freshwater but were essentially marine, or were only found marginally in freshwater. Of these 68 species, 17 were sharks and 51 were batoids. In terms of marine distribution, sharks and rays are found from the tropics to the poles, with eight species having been recorded from the chilly waters of the Arctic. As well as exhibiting an almost worldwide distribution, elasmobranchs are found in most marine habitat types from freshwater lakes to the deep sea. The majority of species are found around the coastline, from the intertidal zone out to the continental shelf and these are broadly considered “coastal species”. Species such as the oceanic whitetip (Carcharhinus longimanus), thresher (Alopias spp. ), mako (Isurus spp.) and manta rays (Manta spp.) are considered open-ocean elasmobranchs because they spend most of their time away from the coast, although many species will cross vast tracts of ocean moving between feeding grounds or between feeding and breeding areas. Finally, there are a group of species that are found only in the deep ocean, down to at least 2,000m (6,560 ft.). The world of deep sea sharks and rays is a fascinating, if poorly understood, one and encompasses a considerable number of species. Indeed, at the Deep–sea Species Identification workshop held in Rome during December 2009, it was noted that almost half of all known Chondrichthyes are deep sea species. The deep sea elasmobranch fauna comprises 254 sharks (just over half the known species) and 237 batoids (just over one-third of known species). In terms of just how deep sharks can go, nobody knows for certain because the deep sea is so difficult a place for us to explore. Given that they don’t have air bladders for buoyancy, it is tempting to consider that the depth range of elasmobranchs is less restricted than it is for bony fishes, which are commonly found at depths as great as 8,400m (27,560 ft.). In a 2016 paper to the Journal of Experimental Biology, however, Jason Treberg and Ben Speers-Roesch argue that chondrichthyan physiology might limit their potential depth. Treberg and Speers-Roesch propose that several factors may operate to reduce the depth-tolerance of elasmobranchs: their use of urea to control their internal tissue water content (osmoregulatory strategy) may conflict with the low temperature and high pressure conditions in the deep sea; the oil in their livers is an energetically costly method of buoyancy and may make surviving in a low-food environment very difficult; and/or their osmoregulatory strategy may deprive them of nitrogen, which again may be an issue in a food-poor environment. Whatever the reason for the scarcity of chondrichthyans in the deep sea relative to bony fishes, it is interesting to note that chimera, skates and rays are more commonly encountered in deep water than sharks are. 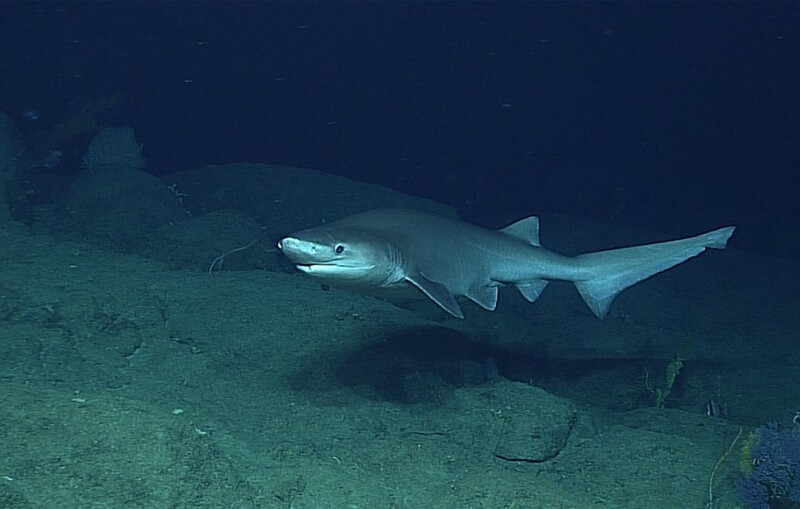 In his 1984 opus, Sharks of the World, Leonard Compagno suggested that the deepest living species was probably the Portuguese shark (Centroscymnus coelolepsis), based on records of it having been caught on long-lines set at 12,000 ft. (3,650m); but such gear may also catch fish on its way up or down, so the species hooked may not have been caught at the final set depth. 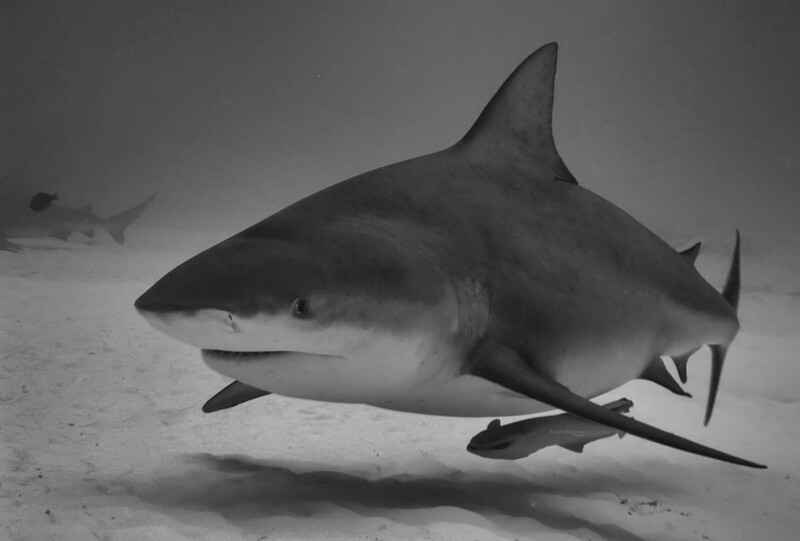 Most species, certainly those of larger sharks, are broadly considered to remain above 2,000m (6,300ft), although there is at least one exception. In the same voyage, Houot described a “beak-nosed skate” (an unidentified Raja sp.) cruising along the seafloor at 7,200 ft. (2,190m). The most cosmopolitan of our shark and ray species inhabit all British territorial waters (i.e. out to 12 nautical miles – 22km – from shore), including the North Atlantic, English Channel and North Sea. These species are the lesser and greater spotted catsharks, and the spiny dogfish (Squalus acanthias) along with the common skate and the thornback ray. Most of the other species seem to be found only in small pockets, or narrow strips around the UK. Overall, of the thousand or so species of elasmobranch, 59 are known from UK waters, and a few other species are in the “maybe” category because of anecdotal sightings or the presence of their egg cases. Of these 59 species, 35 are sharks and 24 are rays (see UK Elasmobranch Species Checklist). The UK elasmobranch fauna is diverse, ranging from the well-known bottom-dwelling coastal small-spotted (or lesser spotted) catshark that’s found throughout our waters to the deep-water Greenland shark (Somniosus microcephalus) that’s resident only in Scottish waters and an occasional visitor to North Sea coasts. British waters are home to the second largest fish species in the modern-day oceans, the basking shark (Cetorhinus maximus), which can be found around the entire UK, although they’re seasonal, tending to arrive in the south-west during the spring and gradually move northwards. We also have some of the more striking species as occasional visitors including the bigeye thresher (Alopias superciliosus) and common thresher (Alopias vulpinus). 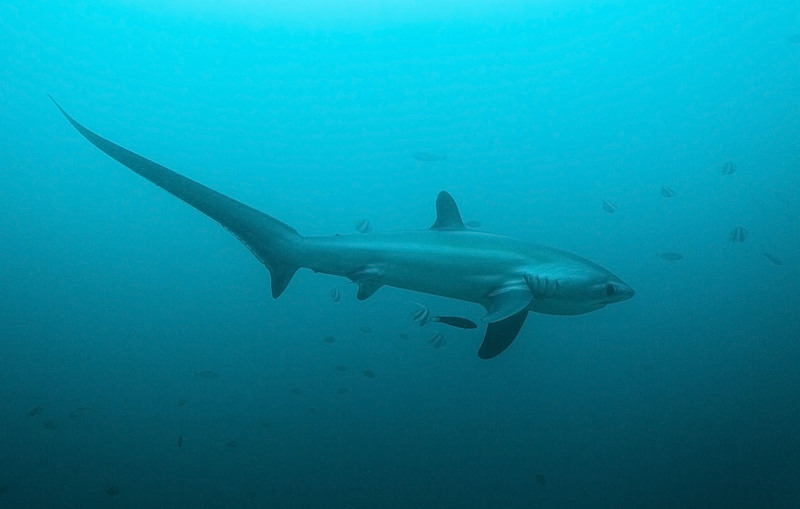 Common threshers have a range extending throughout the north Atlantic, but are more likely to be encountered off the south-west coast of England, as far east as the Isle of Wight, while bigeyes only rarely stray as far north as Cornwall. Smooth hammerheads (Sphyrna zygaena) also turn up from time to time, their range extending as north to Northern Ireland and east through the English Channel. There are occasional reports of great white sharks (Carcharodon carcharias) in British waters (see UK Great White Shark? ), but although the range of this species has been updated to include the UK there remains to be any confirmed sightings and most turn out to be basking sharks.